A little later than usual, but that’s what happens when we actually have good weather on a bank holiday! I end up doing bits out in the garden instead of blogging! 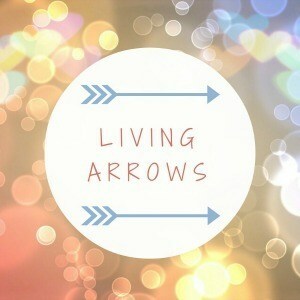 Anyway, without further ado, here is my post for week 16 of Living Arrows. I hope you all had a lovely Easter. We spent it at my Mother-in-Law’s, which is always lovely to visit. We didn’t make it to the seaside this time, but Isla got to see all of her cousins on the Durrans side of the family, and she loved playing with them and kissing and cuddling them. All four cousins are between 2 months and just over 2 years old, and it’s lovely to see them together. And to make it even better, the weather was absolutely beautiful!! This weeks Living Arrows photo is of Isla with her beloved Daddy. 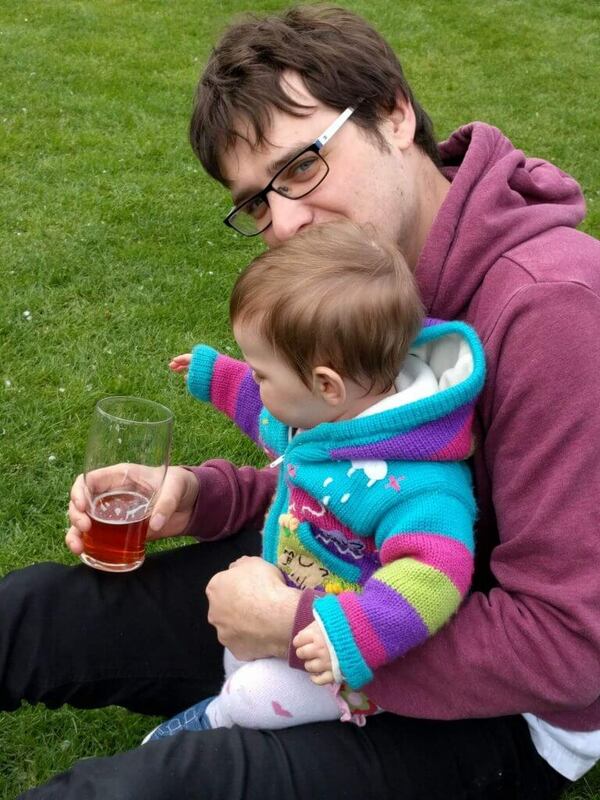 They are sat in a beer garden, and Isla being Isla is of course reaching for Daddy’s beer! I don’t know what it is, but she always reaches for alcohol. I don’t know where she gets it from!!! 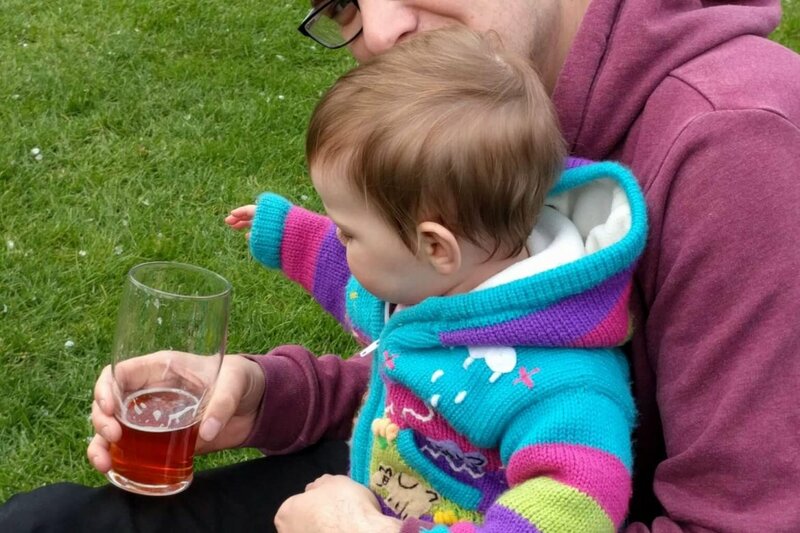 A little bit after this photo we were sat on a picnic bench in the garden, and she swiped the beer glass so that she could grab it with both hands and had a really firm grip on it. I think we might have fun with this little girly when she’s a teenager. Karma some of you might say! Anyway, it was a lovely evening spent in a beer garden with friends. Their little daughter is in the same class as Isla at the moment at nursery. Over the last month or so they’ve really begun to recognise each other when they see each other outside of nursery, whereas before they couldn’t remember who each other was. Now though, it is lovely to see them play together. Isla love their daughter, and tries to keep up with her when playing, and give her lots of cuddles. I’ve said it before, but evenings like these are great. Chris and I have said several times before that we finally feel like we have life sorted and under control again now. Isla *touch wood* seems to be sleeping so much better, and she plays well, and eats well, and we are getting our evenings/nights back. And we can’t wait for the Summer, where the evenings are warm, and we can sit in beer gardens with friends, watching the children play together. That is what life is about. Enjoy your evenings with friends, while watching your children play happily together. With a good beer in your hand! Watch this space, and see if we actually manage it!! How lovely that you got to enjoy some sunshine. She looks determined to get her hands on that drink.